Considering their common interest in the exploration, use and application of space for peaceful purposes, Luxembourg and the United Arab Emirates (UAE) jointly agreed on the opportunity to cooperate on space activities. The Government of the Grand Duchy of Luxembourg, represented by the Deputy Prime Minister, Minister of the Economy, Étienne Schneider, and the UAE, represented by the Minister of State for Higher Education and Chairman of the UAE Space Agency, Dr. Ahmad Belhoul Al Falasi, signed today in Abu Dhabi a memorandum of understanding (MoU) to start bilateral cooperation on space activities with particular focus on the exploration and utilization of space resources. 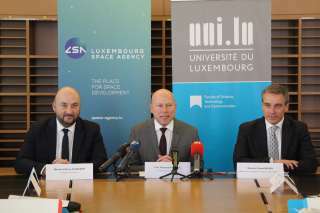 Within its economic development SpaceResources.lu initiative, Luxembourg offers commercial companies an attractive overall framework for space resource exploration and utilization related activities, including but not limited to a legal regime. The Grand Duchy is the first European country to offer a legal and regulatory framework addressing the capability of ownership of space resources and laying down the regulations for the authorization and the supervision of such missions in space. With particular focus on the exploration and utilization of space resources, the five-year cooperation agreement covers the exchange of information and expertise between Luxembourg and UAE space sectors in the areas of space science and technology, human capital development and space policy, law and regulation. Both nations intend to regularly consult on questions of international governance of space to reach common positions in relevant international fora. Luxembourg is promoting actively the peaceful exploration and the sustainable utilization of space resources for the benefit of humankind. In line with those goals, the Grand Duchy encourages discussions on space resources exploration and utilization in all relevant international fora. By signing this MoU with the UAE Space Agency, we continue to endorse cooperation at bilateral and multilateral levels in order to progress together with other nations on a future governance scheme and a global regulatory framework for space resources utilization. Our collaboration with Luxembourg is aligned with the strategic visions of both the Space Agency and the UAE. This includes working towards closer international cooperation, establishing mutually beneficial international partnerships and exchanging scientific knowledge with the rest of the world. The UAE Space Agency recognizes the importance of international collaboration in the field of peaceful exploration of outer space, as this field is considered to be part of humankind’s common heritage. It is extremely important in our view for all competent entities in this field to work together towards the common goal of enhancing the welfare of humanity.